If you’re looking for ways to help your child or grandchild learn and grow spiritually without being too preachy, too boring, or too demanding, look no further. 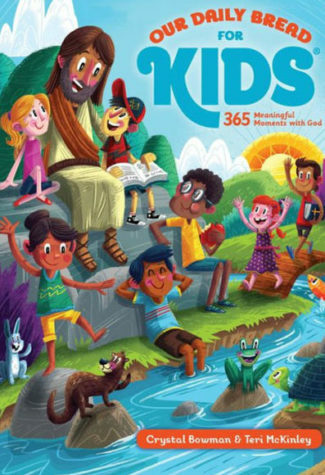 Inside this devotional you’ll find the life-changing wisdom of the Bible in a kid-friendly format that is exciting and fun. Writing in language that kids will understand and enjoy, bestselling children’s author Crystal Bowman and her daughter, Teri McKinley, provide an entire year of daily readings for six- to ten-year-olds. “Even good people have sin in their lives,” writes Crystal. “But when we believe in Jesus as our Savior, God will forgive our sins. His love and mercy never run out.”Short and engaging devotions, easy-to-remember Bible verses, fun illustrations, and exciting facts make this kids-only version of the well-loved Our Daily Bread devotional an excellent way to teach your children more about God.